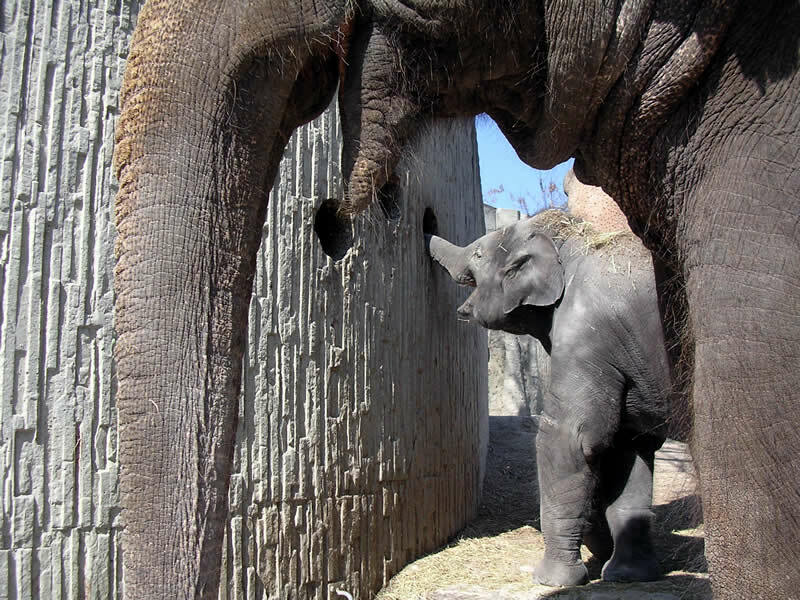 Why do zoo elephants need to be kept occupied? In the wild, animals are active day and night looking for food and water, trying to evade their enemies, defending their territory, looking for a mate and raising their young. In the zoo, many of these activities are taken care of. The animal keepers deliver food and fresh water every day on the dot. There are no predators that could stray into the enclosure. And in most cases, the curators and the animal keepers even choose suitable mates for their animals. How do the elephants keep themselves occupied? Interaction with the elephant bull, as well as the birth and the raising of their young can still keep an elephant group occupied for part of the time and in a species-appropriate manner. On the other hand, many of the main occupations of elephants in the wild are unnecessary in captivity, which can make the comforts of living in a zoo or circus pretty boring after a while. Why is Behavioural Enrichment important? In elephants, boredom soon leads to social tension, aggression and abnormal behaviour. Zoo visitors can easily recognize if an elephant is bored and has not got enough to do: The elephant is observed to be “weaving”, i.e. it stays in one place while slowly moving its head from side to side. Unfortunately, even elephant keepers who are highly committed and imaginative in their efforts to keep their elephant group occupied may not be able to completely prevent such stereotypical behaviour. Thus, behavioural and environmental enrichment is an important component of modern elephant keeping. What does occupational therapy consist of? Every enrichment programme includes daily hygiene and routine training sessions. In addition, the elephants must be allowed to spend a lot of time in their outdoor enclosure. The outdoor enclosure must be designed to be both comfortable and environmentally enriching. Scratching trees and mud pools are necessary for hygiene purposes, but at the same time they are also a way to keep the elephants active. However, more outdoor activities need to be introduced to keep the elephants busy over a longer period of time. How can elephants be kept busy? 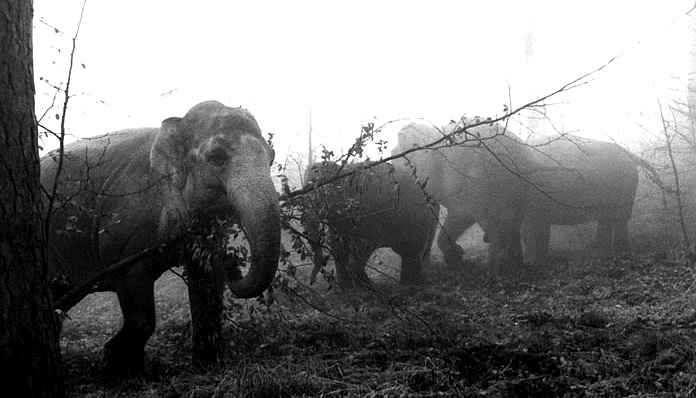 In the wild, foraging for food takes up almost all the elephants’ time. Since eating is their favorite pastime, zoo elephants should be allowed to spend plenty of time searching for food and preparing it for eating. Hay racks should have a narrow opening, further divided by metal bars to make it difficult for the elephants to reach their food while they are in the outdoor enclosure during the day. Since the hay can only be pulled out portion by portion, a relatively small amount of hay can keep the elephants busy over an extended period of time. Both thick and thin tree branches must be broken down into bite-sized portions. This enables the elephants to practice their skills, while eating rough food helps them wear down their back teeth. 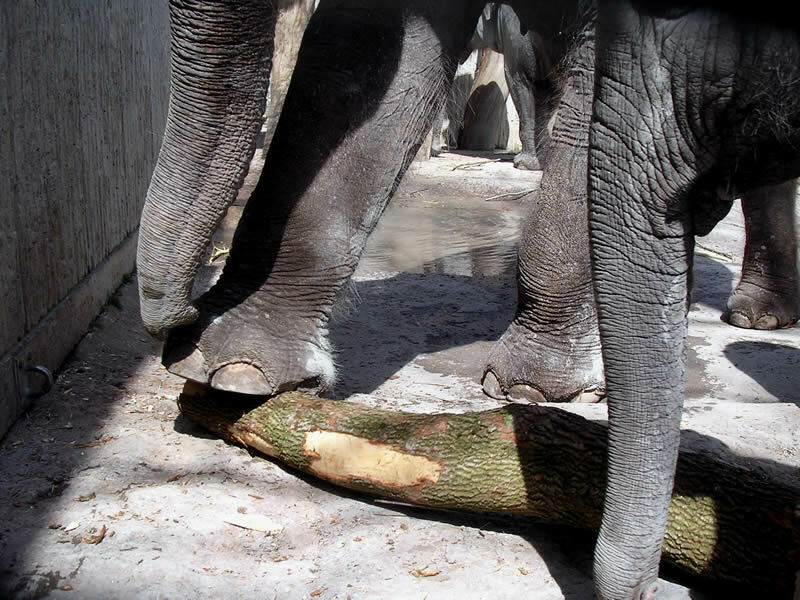 Elephants use their feet or their trunk to bark logs or thick branches. This type of food preparation exercises their agility and fine motor skills. Are there toys for elephants? Another way to keep elephants occupied is to give them appropriate toys. 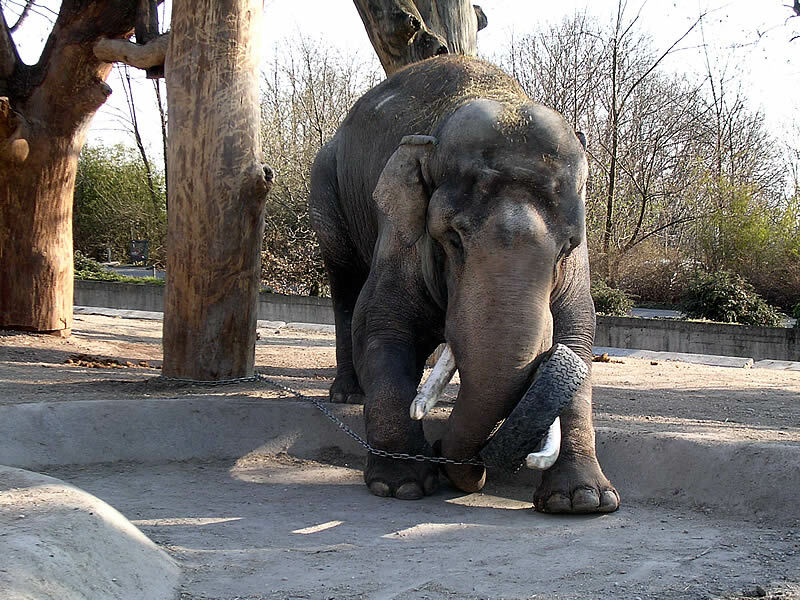 However, since elephants like to toss away their toys or push them into the ditch, all objects must be secured by chains to protect the zoo visitors. 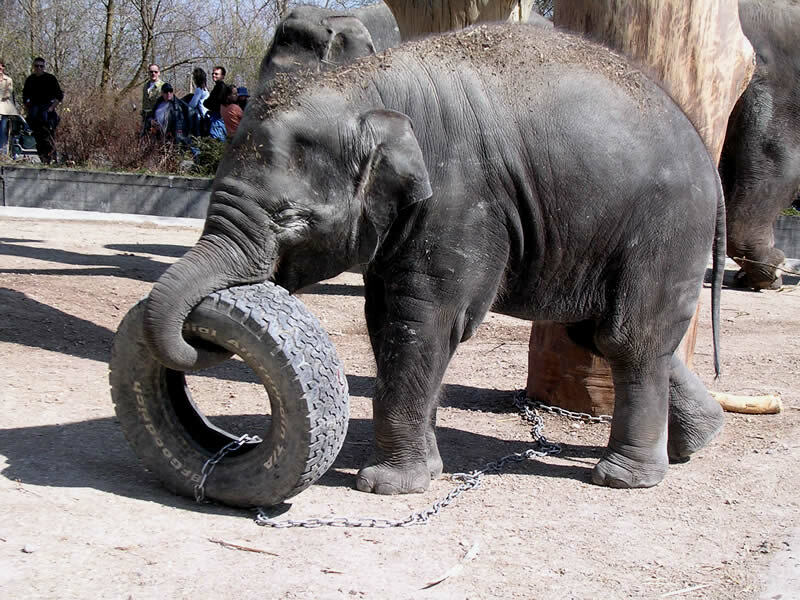 Old car or tractor tires tempt the elephants to test their strength by using their head, trunk or feet to push and hit them. They love to tear at the chain or to throw a tire into the air with all their might, and the public loves to watch them in action. Such physical activity enables the elephants to rid themselves of some of their built-up aggression. This applies particularly to elephant bulls in musth. By attacking their toys they can exercise their strength and let out their aggression. Indoors, the elephants play long games using a large, heavy ball of solid rubber. Whenever the ball falls into the water, the elephants all busy themselves to fish it out, only to push it right back into the pool. Metal beer barrels, suspended from the ceiling or chained to the floor, fascinate elephant calves, cows and bulls alike. The barrels can be filled with small tidbits which fall out when they are turned over. This entices the elephants to interact with the barrels again and again. They delight in the noise made by the chain beating against the barrel and never get tired of launching new attacks. How can toys be made to keep their allure? All toys lose their allure after a time. This is why it is important, after a few days, to replace the tires or barrels, reposition them or to remove them altogether for two or three weeks. Which is the best kind of occupational therapy? A stroll outside the confines of the elephant enclosure is an ideal behaviour enrichment activity for all elephants. For an elephant to be able to move about freely for a while on a meadow or in a forest is its idea of “heaven on earth”! 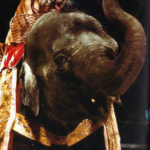 In order to make this happen, however, it is necessary to have “direct contact” with the elephants. 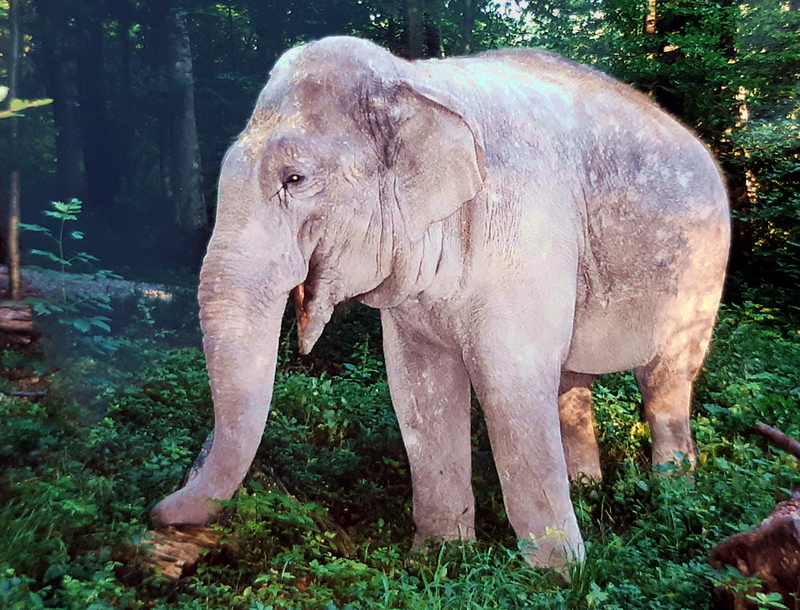 Even if manpower or safety considerations usually make it impossible for the whole elephant group to go, it is sometimes possible to take a single reliable elephant on such a trip around the neighbourhood. 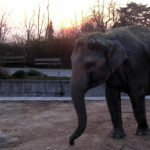 Chhukha, an elephant cow, is particularly well suited to such excursions, since sehe has no function as a mother or an aunt within the elephant group. Her walkabouts enable her to meet other zoo animals as well as people. Such meetings taking place outside the elephants’ usual surroundings provide a welcome change to their daily routine. Even the other elephants are able to profit from these trips. During her walk, Chhukha may walk across a forest floor or through meadow grass and scratch herself on various trees. After her return, the other elephants will welcome her back and enjoy the different scents she has brought back with her. An interesting concept is to combine a way to provide information to zoo visitors with the elephants’ occupational programme: If the public is allowed, in a controlled manner, to feed an elephant and ask the elephant keepers all about the elephants, everybody is happy. 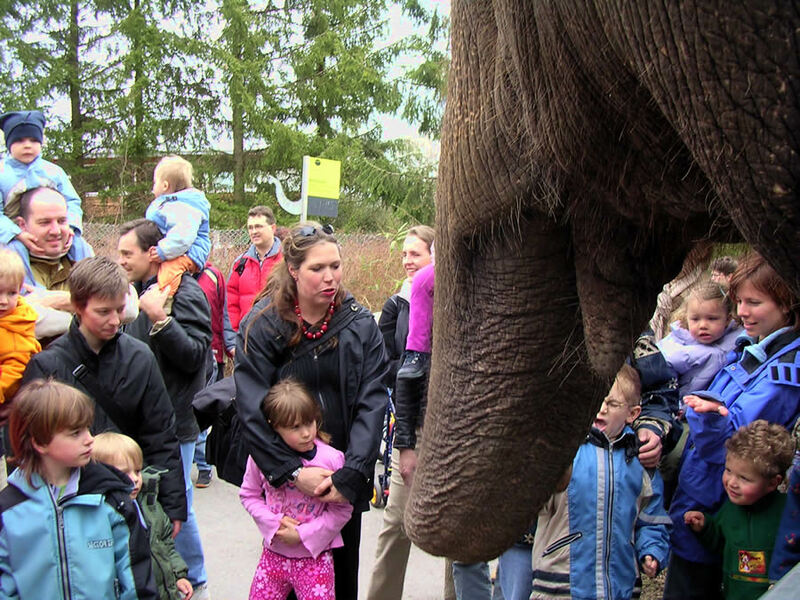 For many zoo visitors, both young and old, this is their first direct contact with an elephant. As a rule, they will be curious and fascinated and will love touching the elephants’ trunk and skin. I am an occupational therapist. I have an interest in working with animals. I was wondering if the occupational therapist that worked with these elephants works with any other animals. Is the therapist aware of any restrictions for OTs working with animals. I am in California where a PT must get certified in rehabilitation specifically in animals. Any help that you can give me would be much appreciated. I have been unable to get good information on OTs working with animals. I’m afraid I’m going to have to disappoint you. 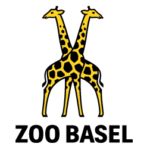 No occupational therapist works with animals in zoos and circuses in Switzerland. 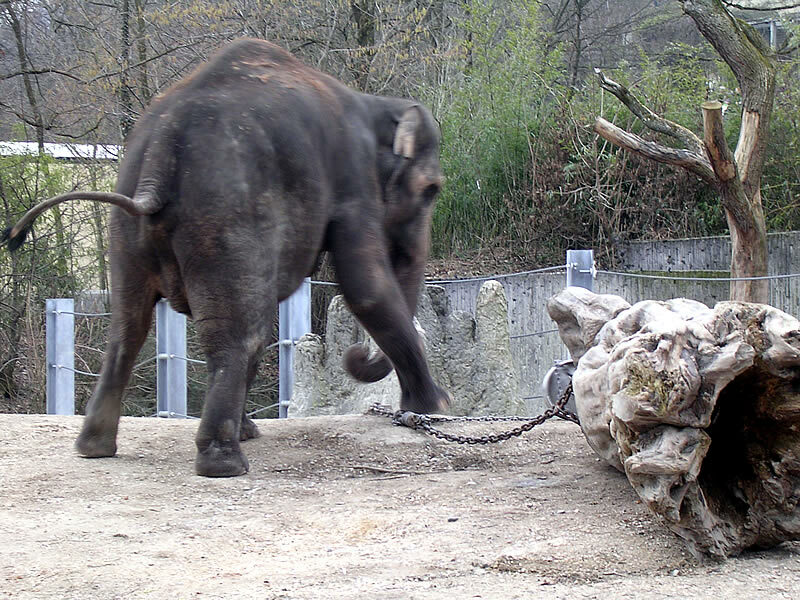 The occupation of elephants and all other zoo animals is the work of the animal keepers. Ideas and experiences are passed on among the dedicated animal keepers. Fortunately, the work of the animal keepers does not only include the cleaning and feeding of the zoo animals. Good animal keepers also occupy with the behaviour of their animals and want to make it possible for them to have a beautiful and exciting life in the zoo every day. I hope you are not disappointed but I am glad that the Behavioural Enrichment of the elephants and all other animals in the zoo belongs also to the important work of the animal keepers.